Welcome to the Galaxial development log for January! I had a few weeks break from working on the game over Christmas and New Years, so decided not to do one for December. Apologies if you visited the forums last month expecting one. Modules that can be added to ship designs come in one of six different tiers. Limited, Standard, Enhanced, Advanced, Prototype and Faction. Similar to item rarities in action role-playing games and mmo's. Once the base module type and tier has been researched, further modifiers can be researched to be added to the module. Below are some examples of the same module type over the different tiers. Limited modules do not have any slots for research modifiers. Each tier gets slightly better stats than the previous, with the requirements, build cost and production time increasing significantly. Standard modules have one slot for a research modifier. Enhanced modules have two research modifier slots. The research modifiers from previous tiers are not carried over to the next one, so you can choose different combinations for each tier. Advanced modules get three slots. Prototype modules have four research modifiers slots. 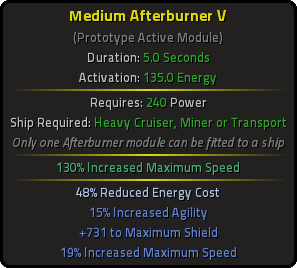 Modifiers in the lighter blue colour affect only that module, and not the entire ship. Faction modules wont have any research modifier slots, but instead provide fixed modifiers that generally cant be found on other modules. These are unique modules to that faction, and have stats which play to its strengths. 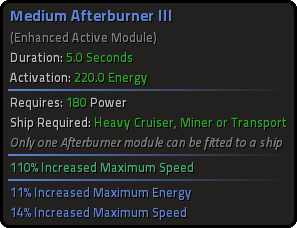 When you select a modifier to be researched, its value is randomly chosen within the range of the module tier. The possible modifier values get better as the tiers increase. You can research the same modifier multiple times to attempt to improve its value. From the options menu you can choose to center align all of the popup tooltip text in the game... I couldn't decide which style I preferred. The module tier names are meant to be the sci-fi equivalent to the sort of naming schemes you get in fantasy games... like normal, magic, rare and legendary. So if anyone has any better naming suggestions please let me know! maybe less slots in total but maybe more changing special effects? which are in the general line of the module researched but do something that isnt just "More of the same"? for example for afterburners a modifier that changes them from being continous and "low" impact to being pulsed and high powered. or provides (partial) immunity to movement imparing effects at the expense of the main afterburner. basically not just boni, but function altering modifiers. This looks really interesting! And I must say that I really like it. It looks very straight-foward with every higher tier of same module becoming clearly superior than it's version from lower tier. Not to mention that slots for research modifiers and fact that they do come in with partly randomised bonuses is just AWESOME! At lest on paper. So... Thing that you may notice at first is that I added "zero tier" at begining and gave it grey colour. I was inspired by Terraria with that decision. Let me explain - every tool or weapon that you craft in Terraria can come with modifier (prefix). It can be positive or negative. If negative modifier will make item worse than they would be without any modifier it's colour turn into grey (that is true only at begining of game though, but let's skip that for sake of this explenations). By doing that we somehow asknowledge the fact that very first tier of given technology is NOT standard. It is bellow standard. Our civilisation still didn't managed to properly utilised that technology. It lack practical expirience. We are unsure if it can be modified in resonable and safe way... In short - this is new stuff and expect it to be subpar untill we will learn how to make it good. Hence the placeholder name "ZERO TIER" insted of "FIRST TIER". But let's move onward. Later we get FIRST TIER, which is our normal (standard) technology. We can make it reliably. It will always work and we can easily mass produce it left and right if we so desire. Hence WHITE colour. Above that we have GREEN and than BLUE - here I absolutly agree with original way. But as finnal "FOURTH TIER" I would suggest RED colour. I strongly believe that YELLOW colour lack strenght to represent best tier in game. Red does it way better. Moreover, yellow can be too simmilar to WHITE in some circumpstances. So... Why purple was moved by me into FACTION TIER? Answer is simple - that colour fit in with all other used and has (for me!) unique feeling. Like it is not fully part of pattern. And hey! Faction Tier fit with that attitude! It also doesn't fit in completly into pattern. It is bit outside of it, but not completly cut off either. I hope that makes some sense. I think that PROTOTYPE doesn't makes sense really... From what I do know, prototype is just very first model that was created. So if anything it should be lowest tier. But even that is not right. So I suggest changing it into Hi-Tech insted. Limited (as much as I like it) makes me think rather in category of "Limited Eddition". So I suggest changing it's name into "Primitive". That fits in Grey colour AND underlines fact that it is most baisic working technology of that kind that we managed to create - by no means standard equipment. We do expect improvements to follow shortly that will allow standarisation. 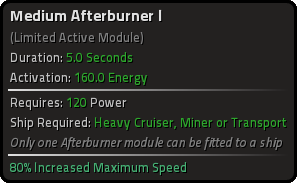 You provided us with Afterburner Module (with it's tiers). 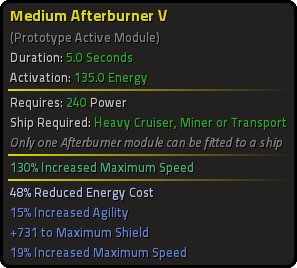 Role of that module's family is to allow ship to move faster for limited amount of time in order to... Well... To close in to enemy, to run away, to be at destination faster... Afterburner Modules baisicly provide increased maximum speed for duration of 5 seconds. Simple way of doing it. How about this - once Afterburners are being researched to STANDARD TIER, new types of afterburners will become aviliable for research. They will fill in same role - will let our ships to move in faster. But in diffrent way. Maybe insted of providing bonus to max speed they will give one instant bonus to speed that will greatly exceed ships' max speed. This will make ships behave just like an arrow shoot out of bow - instant high speed that is being quickly lost. 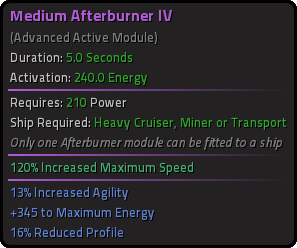 So now, first type of afterburner doesn't favour any of situations where it may come into use. It is good to engage enemies, good to run away and good to just save some time for travel. But second type clearly favours running away scenario over two others. And another type might act even diffrently - it may just teleport ships some distance foward, but also cause them LOOSE all their speed they had before teleportation took place. And only than they can start accelerating again. This type of "afterburner" (I know - not really afterburner anymore - but same family of modules that allow for temporary faster travel) would clearly favour closing in toward targets over any other circumpstance. It can't be use that well to run away - after teleportation ships must gain speed from zero. Can't be use that well to save time when traveling either (unless ships accelerate so fast that it is no issue of course). But for situations when you want ships to close in toward enemies? Perfect! And as small bonus - it allows to "dodge" part of incoming projectiles. Anyway, what I wanted to say is that it may be worth to think of Conflake's post. But I suggest to NOT resign standard, straightfoward tier upgrades. Insted I suggest to pursue "diffrence in kind" by providing more than one type of modules to fit in one role. I do hope that what I said makes sense and was somehow interesting. This is where faction modules will come in. They will grant more 'build-defining' effects that are more function altering, at the expense of not being able to add research modifiers to the module. This looks really interesting! And I must say that I really like it. It looks very straight-foward with every higher tier of same module becoming clearly superior than it's version from lower tier. The lower tiers will still remain useful for quickly mass producing cheap ships, due to the build costs and speed. I would like to avoid them becoming completely obsolete and no longer used after researching something new. I think that PROTOTYPE doesn't makes sense really... From what I do know, prototype is just very first model that was created. I agree and this is why I didnt like the Prototype name. I like your suggestion of "Elite" as well as "Modified" which a few other people have suggested. 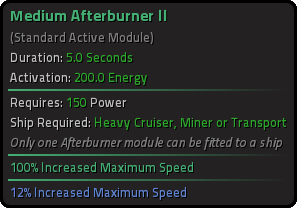 How about this - once Afterburners are being researched to STANDARD TIER, new types of afterburners will become aviliable for research. They will fill in same role - will let our ships to move in faster. But in diffrent way. Maybe insted of providing bonus to max speed they will give one instant bonus to speed that will greatly exceed ships' max speed. Yeah this a possibility for new types of modules to add, once all the basic ones are finished. But as finnal "FOURTH TIER" I would suggest RED colour. I'm not sure Red is going to work well... it doesn't really fit in with the rest of the colour schemes in the game. Here is a quick mock up in Excel... I think I will go with these changes. It is also straightforward to edit all of the user interface colours in the game files if you wish to. Modest wrote: Anyway, what I wanted to say is that it may be worth to think of Conflake's post. But I suggest to NOT resign standard, straightfoward tier upgrades. Insted I suggest to pursue "diffrence in kind" by providing more than one type of modules to fit in one role. I do hope that what I said makes sense and was somehow interesting. im not saying to remove the different tiers, which make sense. but i think the modifier slots should do something [in addition to | instead of] adding flat boni to the numericals. modifiers changing the function of modules instead of just adding numbers would create a great opportunity for horizontal growth to specialise your technology.